A-RAF (Phospho-Ser299) antibody detects endogenous levels of A-RAF only when phosphorylated at serine 299. Affinity-purified fromrabbit antiserum by affinity-chromatography using epitope-specific phosphopeptide. The antibody against non-phosphopeptide was removed by chromatography using non-phosphopeptide corresponding to the phosphorylation site. The antiserum was produced against synthesized phosphopeptide derived from human A-RAF around the phosphorylation site of serine 299 (R-D-SP-G-Y). 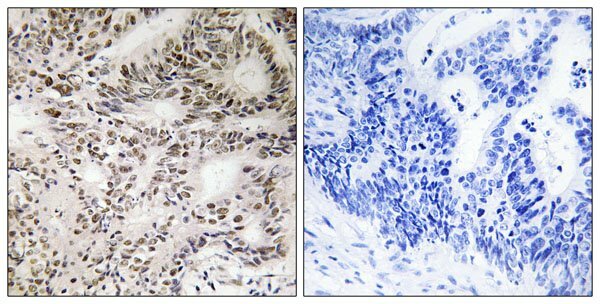 P-peptide-+ Immunohistochemistry analysis of paraffin-embedded human colon carcinoma tissue, using A-RAF (Phospho-Ser299) antibody. Beck T.W., Nucleic Acids Res. 15:595-609(1987). Lee J.-E., Genomics 20:43-55(1994). Kalnine N., Submitted (MAY-2003) to the EMBL/GenBank/DDBJ databases.